The characterisation of the archive as a promise and experience of the future is profoundly important. While the archive holds vestiges of the past and of history, its function must be repurposed and redefined, to remain relevant and secure its future. Directly impacting the evolution of the archive is developments in information technology. The creation of new media, storage mediums, and the conceptual changes that accompany new technologies affect how we understand time and space, thus determining how we form memories. In this respect, the archive is a powerful institution that defines and influences what gets transferred from the individual to collective memory (Hutton 1993: xxii). For any archive, its relationship with its stakeholders and its users needs to be constantly re-examined so that it can continue to address current societal challenges and respond to cultural needs. In 2005, the AFA was founded to provide a much-needed home for the many Asian films that had yet to be preserved. The transnational ambit of the AFA being ‘Asian’ was key and is critical to AFA’s collection focus. Being ‘Asian’ claims a cultural space that investigates the character, complexity, and history that is unique to the Asian cinematic heritage across national borders. The liminal status of the AFA as an Asian archive extends to its organisational structure. Having grown out of and remaining part of the film community, the AFA became a subsidiary of the National Library Board in 2014. Straddling the communal and the governmental is a delicate balance that many heritage institutions must manage. AFA’s collection selection criteria are determined by a list of priorities, considering the condition of the films’ formats and the “Asian-ness” and significance of the films on the cultural landscapes of both its country of origin and internationally. In addition, prioritised films that are independently produced and are not preserved in the home country of the filmmaker or by any other archive, receive special attention. Political sensitivity and managing diplomacy towards each country, individual filmmaker or archive is particularly crucial for a transnational organisation. Organisational film archiving in Southeast Asia was in its infancy as little as 10 years ago, when only Indonesia, Laos, Vietnam and Thailand had their own dedicated film archives. Today, most Southeast Asian countries have their own national archives while a few host an audio-visual archive department as a unit within the larger entity, such as in the case of the National Archives of Singapore (NAS) and Arkib Negara Malaysia (National Archives of Malaysia). Cambodia has a resource centre for Cambodian audio-visual materials while the Philippines established a National Film Archive only in 2011. Given the set-up of these regional institutions, their collecting policies would be centred on a few guidelines: a mandate to preserve their individual national films; films screened in their country; films made about their country; co-produced films by their country. Like many heritage institutions around the world, limited resources, and rapidly deteriorating films make up the challenging film archiving scenarios in Asia. This is a major reason for the hundreds of films, and their related materials such as photographs and publicity kits, from around Asia that were submitted within the first year of the AFA’s Reel Emergency Project’s open call for the deposit of films for preservation in 2006. Musicians, artists and actors performing alongside the sound ensemble, part of Is Everything Louder If the Image Disappears? Photography by Walter Navarro Peremarti. Today, film preservation and film literacy needs are as vital as ever. There are now more film archives in the region to meet national preservation demands and more programmes that address different elements of film literacy. How does the AFA remain relevant and define itself within an environment that has become more vigorous but continues to have gaps and needs that have yet to be fulfilled? For one, digital innovation has captured the imagination and production methods of the film industry. Film archivists in turn bemoan the pressure of finding ways to cope with preserving new unpredictable and unstable digital formats. Apart from the practical concerns of know-how and time, there is the very real issue of acquiring necessary funding to support on-going digital preservation to keep up with new technologies. The estimated cost (in 2007) of preserving film archival master material per title annually was USD1,059 while the digital preservation of the same material was estimated at USD12,514 (Jones, 2012:126). To give these figures some local context, AFA recently restored a film and is preserving it in both celluloid negative and in digital preservation medium. The cost of making a negative print was SGD4,806. Digital preservation and back-ups of the same title cost SGD13,200. While the archival print negative can arguably sit safely for over a hundred years if storage conditions remain constant and cool, to digitally preserve the film in a similar standard, it would be necessary to migrate to a contemporary format every 4-5 years. Factor in specialised active man-hours, inflation, the growing numbers of digital films produced every year, and the necessary funds to continue archival work becomes mind-boggling. With this in mind, archives can no longer make do with an ad hoc policy to “acquire everything, just in case”. As such, the AFA has in place a carefully articulated selection policy that is tied to access issues, constantly remembering that an archive (or the archivist) must look backwards and forward in time. While acquiring filmic material, he or she must assess if someone in the future may find the material significant and useful (Kula, 2003: 12). In addressing this issue, it is particularly important for the AFA not to privilege only the mainstream, the powerful, and the state. As the AFA is not tied to one particular national mindset and is flexible in responding to the demands and needs of stakeholders and users, the AFA can adopt a selection and curatorial view that is distinctive to most national film archives in the world. Filmmakers and artists of various disciplines have approached AFA to explore a showcase of their works within AFA’s public programmes. This sparked numerous discussions on how AFA could initiate more ways of examining and thinking about cinema through new perspectives. Cinema with its inherent historical value could be used as a way to cultivate multiple interests in film heritage from different sectors of society. A recent event organised by the AFA resonates with such efforts to balance the showcasing of multiple voices and telling of alternative stories. Is Everything Louder If the Image Disappears? was a film/sound programme that examined the sonic component of scenography. 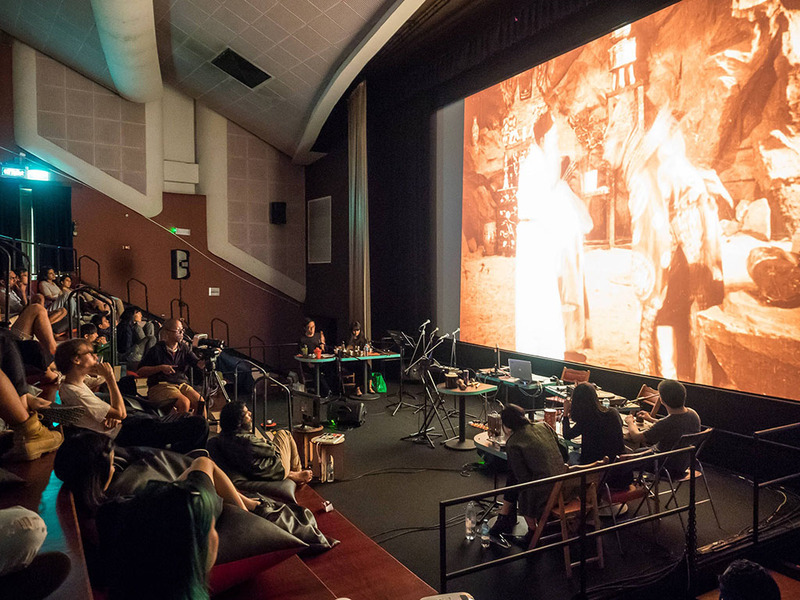 The programme was made up of two parts – the first part was screening a rare restored silent film Pan Si Dong (1927) with live scoring by non-musicians performing a combination of foley and ambient music improvisation. The second part of the programme was a deconstruction / reconstruction of the film, with the visual stripped, leaving behind only the inter-titles. Actors performed the reading of the inter-titles alongside a live scoring by the sound ensemble. The departure from the usual music scoring traditionally accompanying a silent film and the intentional investigation of the impact of visual and audio encourages and challenges the perceptions and interpretations of the participants and audiences. AFA engaged a range of multi-disciplinary artists such as Bani Haykal and Zai Tang for the project. This gave the archive and creative personnel who would normally not interact, the chance to work together, thus creating opportunities for exchange and an openness to fresh ideas. Moreover, it provided the opportunity for AFA’s audiences and the AFA to look at historical films through new contemporary and experimental mediums – bringing new meaning to canonical films. 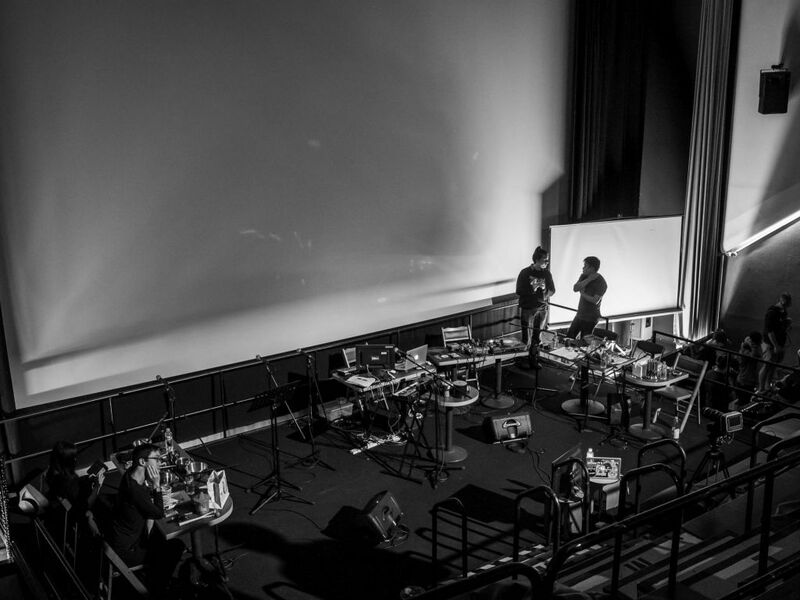 Screening of the silent film Pan Si Dong with live performance, part of Is Everything Louder If the Image Disappears? Photography by Walter Navarro Peremarti. 1. Restoration is not possible and it is not desirable, regardless of its object or purpose. Obedience to this principle is the most responsible approach to film preservation. 2. If film had been treated properly from the very beginning, there would be less of a need for film preservation today and citizens would have had access to a history of cinema of their choice. 3. Turning silver grains into pixels is not right or wrong per se; the real problem with digital restoration is its false message that moving images have no history, its delusion of eternity. 4. Governments want to save, not give, money. Offer them economical solutions; therefore, explain to them why the money they give to massive digitization is wasted. Give them better options. Treating with the utmost care what has survived. Better yet, doing nothing. Let moving images live and die on their own terms. 5. Be aware that the world is not interested in film preservation. People can and should be able to live without cinema. A full discussion on these points is not within the scope of this article but it is easy to see how Usai’s provocative statements would have spurred a lively discussion on the future of film curatorship in the transition from the analogue to the digital. He laments the absence of preservation from the beginning of film history, making it virtually impossible for film restoration. Digital “content” is deemed to lack history and tangibility, and he reminds quite rightly that the average person is disinterested in film preservation, recommending to let film die with dignity. Hisashi Okajima, Chief Curator of the National Film Center/ National Museum of Modern Art, Tokyo, responded to Usai’s speech with a love letter to film. While Okajima admits that Usai’s manifesto provides food for deep thought, he pledges to digitally restore Ozu’s cinematic treasures. He will strive to maintain the best possible film preservation centre he can as this is the best way he knows how to continue getting future generations of audiences to see the films that his organisation (The National Film Center) has been preserving (Okajima, 2013:9-10). Indeed, the way forward for archives in an age of digital technology and film-making is unclear and without one simple strategy or remedy. The AFA has pledged in its mission to preserve Asian cinema and to make this art form available for all to appreciate and enjoy – just how it carries out this mission rests on the shoulders of the young archivists and programmers in AFA. A key part of this process is attracting new audiences to AFA’s events and maintaining their interest in film heritage. By tapping on the National Library and public libraries’ platforms, AFA’s screening programmes Alt Screen and Fade In / Fade Out have seen a new demographic of audiences watching non-commercial Asian films and joining in discussions about them. Curating inter-disciplinary programmes is one direction that the AFA has recently embarked on Film-visual art, film-music, film-literary word, film-theatre, film-dance. Exploring the intersections of these disciplines help to develop new audiences and increase an interest in what the archive can offer. AFA’s collaborations with the Centre for Contemporary Art and the National Art Council have brought film and visual art audiences and communities together. State of Motion, AFA’s annual programme held during Singapore Art Week, a key event in Singapore’s cultural calendar developed around Singapore Art Stage, encourages participants to remember, re-imagine, envision and visualise featured made in Singapore films and film locations from the past in Singapore’s ever-changing landscape, alongside commissioned art works that reflect on Singapore’s social, cultural, political history. AFA has also been tapping on its stakeholders (especially filmmakers and academics) to help advocate its work. A recent advocacy initiative, Save Our Film (https://www.asianfilmarchive.org/saveourfilm/), addressed new challenges in preserving digital materials. Some of Southeast Asia’s acclaimed filmmakers have pitched in to highlight the urgency and importance of preserving our cinematic heritage, and to encourage more filmmakers to deposit their films and help to spread the message of film preservation. These efforts are part of the process of building AFA’s identity as an Asian film hub while re-purposing its services. More than a mere repository and a library of resource, the archive is making the preserved collection of cinematic heritage relevant by creating contemporary, innovative, and experimental programmes that will develop a critical thinking audience, willing to actively commit with the archive towards the preservation of Asian heritage through its films. Rather than just passively acquiring, the AFA wishes to actively engage with its stakeholders and audience through its curation. In so doing, the archive has also redefined the way it sustains itself. It offers not only resources for traditional research but has also developed multiple platforms for creative journeys and in-depth conversations on different subjects, with film as the springboard for those discussions. A recent definition of film curatorship as “the art of interpreting the aesthetics, history, and technology of cinema through the selective collection, preservation, and documentation of films and their exhibition in archival presentations” (Francis, D, Film Curatorship: Archives, Museums, and the Marketplace, 2008:170) has offered a way forward in the preservation of film. It has provided a renewed sense of purpose of AFA’s mission “Save, Share, and Explore” – exciting new generations of film lovers (and anyone concerned about cultural heritage) to fulfil “a promise, a responsibility for tomorrow” – an archive for the future. Caputo, J D, 1997, The Prayer and Tears of Jacques Derrida: Religion without Religion, Bloomington: Indiana University Press. Derrida, J, 1996, Archive Fever: A Freudian Impression, Chicago: University of Chicago Press. Hutton, P, 1993, History as an Art of Memory, Hanover: University Press of New England. Francis, David, Film Curatorship: Archives, Museums, and the Marketplace, Paolo Cherchi Usai, David Fracis, Alexander Horwath, Michael Loebenstein (Eds. ), 2008, Italy, Austria: SYNEMA Publikationen and Le Giornate del Cinema Mutoa. Jones, J, 2012, The Past is a Moving Picture: Preserving the Twentieth Century on Film, University Press of Florida. Kula, S, 2003, Appraising moving images: assessing the archival and monetary value of film and video records, MD: Lanham, Scarecrow Press. Okajima, H, 2013, “A Love Letter to Film”, Journal of Film Preservation, Issue 89, Belgium: International Federation of Film Archives. Pearce, S, 1992, Museums, Objects and Collections, Washington: Leicester University Press. Schwartz, J M and Cook, T, (Eds) 2002, “Archives, Records, and Power: The Making of Modern Memory”, Archival Science, Netherlands: Kluwer Academic Publishers. Usai, P C, 2011, “The Lindgren Manifesto: The Film Curator of the Future”, Journal of Film Preservation, Issue 84, Belgium: International Federation of Film Archives.